Mike “Timex” McDonald timed his charge to the top of the EPT Madrid perfectly to finish the day narrowly ahead of Danish player Frederik Jensen, with the pair 40 big blinds clear of the chasing pack headed by Russian journeyman Dmitry Vitkind. 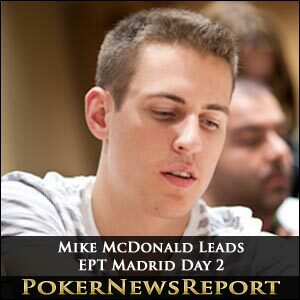 McDonald sealed his position as chip leader when his pocket Aces found quads on the board in one of last hands of the day and leads the 116 remaining players towards the bubble of the PokerStars sponsored EPT Madrid Main Event. Following two extremely aggressive Day 1s which saw the field of 477 reduced by half, Day 2 was limited to just five levels as the carnage continued. A further 167 players were eliminated during the day, and organisers drew the line at five levels to ensure that the tournament continued to its scheduled fifth day on Saturday. Among those who will spend the rest of the week competing in side events or admiring the architecture of Madrid were previous EPT winners Jake Cody, David Vamplew, Anton Wigg, Michael Eiler, Arnaud Mattern and Michael Tureniec. Although the prospect of the first dual EPT winner is still on, with Kevin MacPhee, Nicholas Levi and Rupert Elder still alive and kicking, the likelihood of it occurring in Madrid diminishes with every passing hand. Other players that were sent to the rail on an eventful Wednesday included Chris Moorman, Nacho Barbero, Dominik Nitsche, Anton Ionel ,Day 1A chip leader Sergiy Baranov and Per Linde in the most unfortunate of circumstances. Linde was down to his last 700 chips (blinds 800/1,600) when he took five hands in a row to build his stack up to 25,000. In the sixth hand Linde was dealt A♠ A♣ and his shove was called by David Gomez Morante who was holding Q♥ Q♣. The Q♠ on the flop was ominous for Linde, and with no further help from the board, Linde was busted out in the cruellest fashion. Players who are still chasing the first prize of €545,000 and the remainder of the money in the €2,313,450 prize pool include Barny Boatman (81,700), Dermot Blain (75,000), James Sudworth (69,100), Johnny Lodden (180,900), Kevin MacPhee (181,700), Matt Frankland (57,000), MacLean Carr (130,700), Melanie Weisner (43,200) and Olivier Busquet (80,500). Some of these players will have to go some to catch the chip leaders or even to make it into the 72 player bubble which should be burst around tea-time today. When play recommences at the Gran Casino Madrid for Day 3, blinds will be 1,200/2,400 with a 300 chip ante and play is scheduled to continue until we are down to our last 24 players.